Qualifying ended just this past Friday. 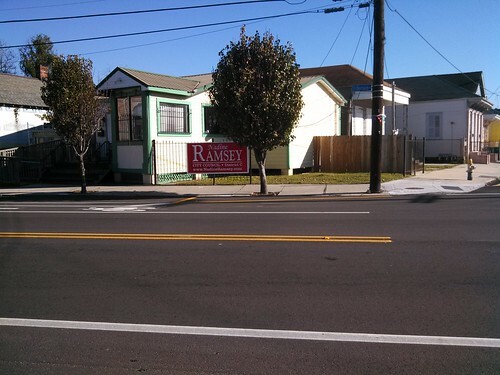 Candidates in municipal elections sure haven't wasted any time getting their signs up in time for your morning commute. 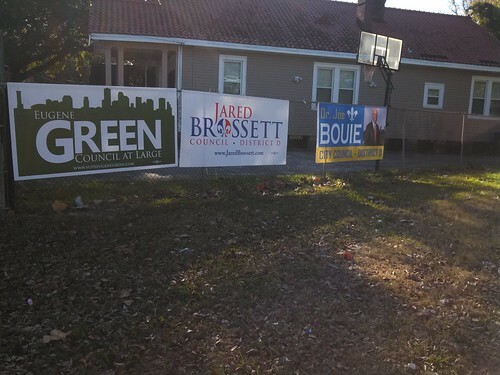 These were all up along Broad St and St. Bernard Avenue Monday morning. Not to be outdone by any of these people, Mitch Landrieu launched his first TV ad Sunday afternoon at the end of the first quarter of Saints-Rams game. The Saints at that point were trailing 0-14 thanks to two Drew Brees interceptions and some exceptionally poor tackling on defense. Things would only go downhill from there. Not exactly the opportune moment to pop in with a, "This Quarter Of Saints Football Sponsored By Mitch Landrieu For Mayor" but it's a risk you run when you buy that slot. Well, that and the risk that voters will think you are running against Ronnie Lamarque. It didn't help matters that Mitch's ad did something Saints fans have been screaming for the networks who carry Saints games to stop doing since before Landrieu even took office. It leaned heavily on imagery from the post-Katrina flooding of New Orleans. Set to a gospel version of the last stanza of Bob Dylan's "Pressing On," the one-minute ad juxtaposes photos of inundated landmarks and neighborhoods, shortly after Hurricane Katrina, with their stages of recovery today. There are no spoken words, but it ends with the words "Let's Keep It Going" and Landrieu's mantra of "One Team" flashing on the screen. The good news about this spot is that it is ripe for parody. One can imagine an ad set to "Ain't Dere No More" where people hold up photos of what used to be wherever all the new Walgreens and Dollar Stores are. Or we could hold up a photo of some musicians on a corner in front of that same corner where a code enforcement officer waives a decibel meter at us. 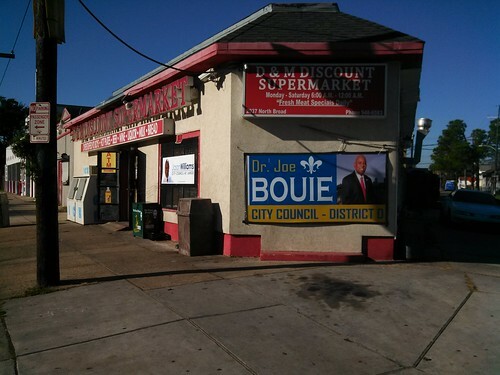 Or we could stand on Jackson Avenue and hold up the asking price of the Da Fresh Seafood Market. FFRI is a grant program designed to bring grocers into so-called "food deserts"; poorer neighborhoods without ready access to fresh healthy groceries. In practice, it's turning out to be just seed money for real estate flipping. Or maybe we could shoot one in the Quarter where we hold a photo of Brennan's in front of a photo of a shuttered Brennan's in front of another photo of Brennan's while unpaid Brennan's employees wait patiently in the background. That one is my favorite. More than any of these other images, in illustrates the static economic, social and political hierarchy of the city despite its many celebrated but superficial "signs of progress."